For the Chinese cursive handwriting in calligraphy, see Cursive script (East Asia). For the style of typeface, see Italic type. For the rock band, see Cursive (band). Cursive (also known as script or longhand, among other names[a]) is any style of penmanship in which some characters are written joined together in a flowing manner, generally for the purpose of making writing faster. Formal cursive is generally joined, but casual cursive is a combination of joins and pen lifts. The writing style can be further divided as "looped", "italic" or "connected". The cursive method is used with many alphabets due to its improved writing speed and infrequent pen lifting. In some alphabets, many or all letters in a word are connected, sometimes making a word one single complex stroke. Ligature is writing the letters of words with lines connecting the letters so that one does not have to pick up the pen or pencil between letters. Commonly some of the letters are written in a looped manner to facilitate the connections. In common printed Greek texts, the modern small letter fonts are called "cursive" (as opposed to uncial) though the letters do not connect. In looped cursive penmanship, some ascenders and descenders have loops which provide for joins. This is generally what people refer to when they say "cursive". Cursive italic penmanship—derived from chancery cursive—uses non-looped joins or no joins. In italic cursive, there are no joins from g, j, q or y, and a few other joins are discouraged. [not in citation given] Italic penmanship became popular in the 15th-century Italian Renaissance. The term "italic" as it relates to handwriting is not to be confused with italic typed letters that slant forward. Many, but not all, letters in the handwriting of the Renaissance were joined, as most are today in cursive italic. The origins of the cursive method are associated with practical advantages of writing speed and infrequent pen-lifting to accommodate the limitations of the quill. Quills are fragile, easily broken, and will spatter unless used properly. They also run out of ink faster than most contemporary writing utensils. Steel dip pens followed quills; they were sturdier, but still had some limitations. The individuality of the provenance of a document (see Signature) was a factor also, as opposed to machine font. Cursive was also favored because the writing tool was rarely taken off the paper. The term cursive derives from the 18th century Italian corsivo from Medieval Latin cursivus, which literally means running. This term in turn derives from Latin currere ("to run, hasten"). Although the use of cursive appeared to be on the decline, it now seems to be coming back into use. In Bengali cursive script  (also known in Bengali as "professional writing") the letters are more likely to be more curvy in appearance than in standard Bengali handwriting. Also, the horizontal supporting bar on each letter (matra) runs continuously through the entire word, unlike in standard handwriting. 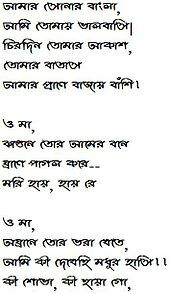 This cursive handwriting often used by literature experts differs in appearance from the standard Bengali alphabet as it is free hand writing, where sometimes the alphabets are complex and appear different from the standard handwriting. Roman cursive is a form of handwriting (or a script) used in ancient Rome and to some extent into the Middle Ages. It is customarily divided into old (or ancient) cursive, and new cursive. Old Roman cursive, also called majuscule cursive and capitalis cursive, was the everyday form of handwriting used for writing letters, by merchants writing business accounts, by schoolchildren learning the Latin alphabet, and even by emperors issuing commands. New Roman, also called minuscule cursive or later cursive, developed from old cursive. It was used from approximately the 3rd century to the 7th century, and uses letter forms that are more recognizable to modern eyes; "a", "b", "d", and "e" have taken a more familiar shape, and the other letters are proportionate to each other rather than varying wildly in size and placement on a line. The Greek alphabet has had several cursive forms in the course of its development. In antiquity, a cursive form of handwriting was used in writing on papyrus. It employed slanted and partly connected letter forms as well as many ligatures. Some features of this handwriting were later adopted into Greek minuscule, the dominant form of handwriting in the medieval and early modern era. In the 19th and 20th centuries, an entirely new form of cursive Greek, more similar to contemporary Western European cursive scripts, was developed. During the Middle Ages, the flowing, connected cursive script of the Arabic language inspired Western Christian scholars to develop similar cursive scripts for Latin. These scripts then became the basis for all of the Latin-based cursive scripts used in Europe. Cursive handwriting developed into something approximating its current form from the 17th century, but its use was neither uniform, nor standardized either in England itself or elsewhere in the British Empire. 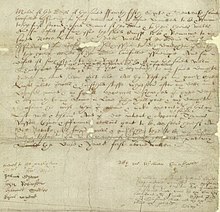 In the English colonies of the early 17th century, most of the letters are clearly separated in the handwriting of William Bradford, though a few were joined as in a cursive hand. In England itself, Edward Cocker had begun to introduce a version of the French ronde style, which was then further developed and popularized throughout the British Empire in the 17th and 18th centuries as round hand by John Ayers and William Banson. In the American colonies, on the eve of their independence from the Kingdom of Great Britain, it is notable that Thomas Jefferson joined most, but not all the letters when drafting the United States Declaration of Independence. However, a few days later, Timothy Matlack professionally re-wrote the presentation copy of the Declaration in a fully joined, cursive hand. Eighty-seven years later, in the middle of the 19th century, Abraham Lincoln drafted the Gettysburg Address in a cursive hand that would not look out of place today. Note that not all such cursive, then or now, joined all of the letters within a word. Cursive handwriting from the 19th-century USA. 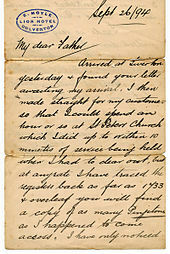 In both the British Empire and the United States in the 18th and 19th centuries, before the typewriter, professionals used cursive for their correspondence. This was called a "fair hand", meaning it looked good, and firms trained their clerks to write in exactly the same script. In the early days[when?] of the post office, letters were written in cursive – and to fit more text on a single sheet, the text was continued in lines crossing at 90 degrees from the original text. Block letters were not suitable for this. Although women's handwriting had noticeably different particulars from men's, the general forms were not prone to rapid change. 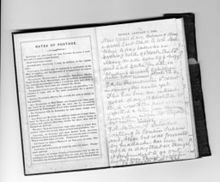 In the mid-19th century, most children were taught the contemporary cursive; in the United States, this usually occurred in second or third grade (around ages seven to nine). Few simplifications appeared as the middle of the 20th century approached. After the 1960s, a movement originally begun by Paul Standard in the 1930s to replace looped cursive with cursive italic penmanship resurfaced. It was motivated by the claim that cursive instruction was more difficult than it needed to be: that conventional (looped) cursive was unnecessary, and it was easier to write in cursive italic. Because of this, a number of various new forms of cursive italic appeared, including Getty-Dubay, and Barchowsky Fluent Handwriting. In the 21st century, some of the surviving cursive writing styles are Spencerian, Palmer Method, D'Nealian, and Zaner-Bloser script. D'Nealian Script, a cursive alphabet – lower case and upper case. One of the earliest forms of new technology that caused the decline of handwriting was the invention of the ballpoint pen, patented in 1888 by John Loud. Two brothers, László and György Bíró, further developed the pen by changing the design and using different ink that dried quickly. With their design, it was guaranteed that the ink would not smudge, as it would with the earlier design of pen, and it no longer required the careful penmanship one would use with the older design of pen. After World War II, the ballpoint pen was mass-produced and sold for a cheap price, changing the way people wrote. Over time the emphasis of using the style of cursive to write slowly declined[quantify], only to be later impacted by other technologies such as the phone, computer, and keyboard. Cursive has been in decline throughout the 21st century due to its perceived lack of necessity. The Fairfax Education Association, the largest teachers' union in Fairfax County, Virginia, has called cursive a "dying art". Many consider cursive too tedious to learn and believe that it is not a useful skill. On the 2006 SAT, a United States post-secondary education entrance exam, only 15 percent of the students wrote their essay answers in cursive. However, students might be discouraged from using cursive on standardized tests due to exams written in hard to read handwriting receiving fewer marks, and some graders may have difficulties reading cursive. In a 2007 survey of 200 teachers of first through third grades in all 50 American states, 90 percent of respondents said their schools required the teaching of cursive. A 2008 nationwide survey found elementary school teachers lacking formal training in teaching handwriting to students. Only 12 percent of teachers reported having taken a course in how to teach it. In 2012, the American states of Indiana and Hawaii announced that their schools will no longer be required to teach cursive (but will still be permitted to), and instead will be required to teach "keyboard proficiency". Since the nationwide proposal of the Common Core State Standards in 2009, which do not include instruction in cursive, the standards have been adopted by 44 states as of July 2011, all of which have debated whether to augment them with cursive. Many historical documents, such as the United States Constitution, are written in cursive—the inability to read cursive therefore precludes one from being able to fully appreciate such documents in their original format. Despite the decline in the day-to-day use of cursive, it is being reintroduced to the curriculum of schools in the United States. States such as California, Idaho, Kansas, Massachusetts, North Carolina, South Carolina, New Jersey, and Tennessee have already mandated cursive in schools as a part of the Back to Basics program designed to maintain the integrity of cursive handwriting. Cursive instruction is required by grade 5 in Illinois, starting with the 2018–2019 school year. Some[who?] argue that cursive is not worth teaching in schools and "in the 1960s cursive was implemented because of preference and not an educational basis; Hawaii and Indiana have replaced cursive instruction with 'keyboard proficiency' and 44 other states are currently weighing similar measures." With the widespread use of computers, researchers set out to test the effectiveness of both mediums. In a study done by Pam Mueller which compared scores of students who took notes by hand and via laptop computer showed that students who took notes by hand showed advantages in both factual and conceptual learning. Another study done by Anne Mangen showed that children showed an acceleration in learning new words when they wrote them by hand rather than on a computer screen. Learning to write in cursive is alleged (by its practitioners) to be a stepping stone to developing neat handwriting, and, in a third study conducted by Florida International University, professor Laura Dinehart concluded that students with neater handwriting tend to develop better reading and writing skills, though it is difficult to conclude causation from such an association. Aside from these cognitive benefits, students with dyslexia, who have difficulty learning to read because their brains have difficulty associating sounds and letter combinations efficiently, have found that cursive can help them with the decoding process because it integrates hand-eye coordination, fine motor skills and other brain and memory functions. However, students with dysgraphia may be badly served, even substantially hindered, by demands for cursive. Up to the 19th century, Kurrent (also known as German cursive) was used in German language longhand. Kurrent was not used exclusively, but in parallel to modern cursive (which is the same as English cursive). Writers used both cursive styles: location, contents and context of the text determined which style to use. A successor of Kurrent, Sütterlin, was widely used in the period 1911–1941 until the Nazi Party banned it, and German speakers brought up with Sütterlin continued to use it well into the post-war period. Today, three different styles of cursive writing are taught in German schools, the Lateinische Ausgangsschrift [de] (introduced in 1953), the Schulausgangsschrift [de] (1968), and the Vereinfachte Ausgangsschrift [de] (1969). The German National Primary Schoolteachers' Union has proposed replacing all three with Grundschrift, a simplified form of non-cursive handwriting adopted by Hamburg schools. The standard modern Russian Cyrillic cursive alphabet with uppercase and lowercase letters, used in school education. The Russian Cursive Cyrillic alphabet is used (instead of the block letters) when handwriting the modern Russian language. While several letters resemble Latin counterparts, many of them represent different sounds. Most handwritten Russian, especially personal letters and schoolwork, uses the cursive Russian (Cyrillic) alphabet. Most children in Russian schools are taught in the 1st grade how to write using this Russian script. Cursive forms of Chinese characters are used in calligraphy; "running script" is the semi-cursive form and "rough script" (mistakenly called "grass script" due to misinterpretation) is the cursive. The running aspect of this script has more to do with the formation and connectedness of strokes within an individual character than with connections between characters as in Western connected cursive. The latter are rare in hanzi and in the derived Japanese kanji characters which are usually well separated by the writer. 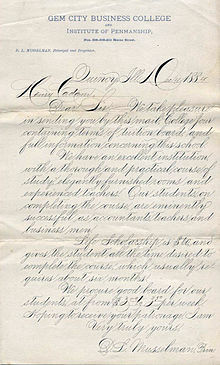 Example of classic American business handwriting known as Spencerian script from 1884. Table of 19th-century Greek cursive letter forms. Bold running hand exemplar by English chirographer Joseph Carstairs published 1820. ^ Bounds, Gwendolyn (5 October 2010). "How Handwriting Boosts the Brain". The Wall Street Journal. New York: Dow Jones. ISSN 0099-9660. Retrieved 30 August 2011. ^ Harper, Douglas. "cursive". Online Etymology Dictionary. Retrieved 29 October 2011. ^ Rueb, Emily S. (13 April 2019). "Cursive Seemed to Go the Way of Quills and Parchment. Now It's Coming Back". The New York Times. Retrieved 20 April 2019. ^ Adak, Chandranath; Chaudhuri, Bidyut B.; Blumenstein, Michael (23–26 October 2016). Offline Cursive Bengali Word Recognition Using CNNs with a Recurrent Model. 15th International Conference on Frontiers in Handwriting Recognition (ICFHR). Shenzhen, China. pp. 429–434. doi:10.1109/ICFHR.2016.0086. Retrieved 19 March 2017. ^ Hulse, David Allen (2002). The Eastern Mysteries: An Encyclopedic Guide to the Sacred Languages & Magickal Systems of the World (Key of It All). Llewellyn Publications. p. 185. ISBN 978-1567184280. ^ Whalley, Joyce Irene (1980). The Art of Calligraphy, Western Europe & America. London: Bloomsbury. p. 400. ISBN 978-0-906223-64-2. ^ Livingston, Ira (1997). "The Romantic Double-Cross: Keats's Letters". Arrow of Chaos: Romanticism and Postmodernity. University of Minnesota Press. p. 143. ISBN 978-0816627950. ^ Heller, Karen (2 September 2018). "From punishing to pleasurable, how cursive writing is looping back into our hearts". The Washington Post. Retrieved 8 September 2018. ^ Giesbrecht, Josh (28 August 2015). "How The Ballpoint Pen Killed Cursive". The Atlantic. Retrieved 30 October 2015. ^ Enstrom, E. A. (1965). "The Decline of Handwriting". The Elementary School Journal. 66 (1): 22–27. doi:10.1086/460256. ^ a b Shapiro, T. Rees (4 April 2013). "Cursive handwriting is disappearing from public schools". The Washington Post. ISSN 0190-8286. Retrieved 30 October 2015. ^ Braiker, Brian (25 January 2011). "Tossing the Script: The End of the Line for Cursive?". ABC News. Retrieved 30 October 2015. ^ "The Handwriting Is on the Wall". The Washington Post. 11 October 2006. ^ Adams, Richard (21 August 2016). "Poor handwriting 'may hinder students' chances of exam success'". The Guardian. Retrieved 14 November 2018. ^ "Schools debate: Is cursive writing worth teaching?". USA Today. 23 January 2009. ^ Graham, Steve; Harris, Karen R.; Mason, Linda; Fink-Chorzempa, Barbara; Moran, Susan; Saddler, Bruce (2008). "How do primary grade teachers teach handwriting? A national survey". Reading and Writing. New York: Springer Netherlands. 21 (1–2): 49–69. doi:10.1007/s11145-007-9064-z. ISSN 0922-4777. Retrieved 31 July 2011. ^ Webley, Kayla (6 July 2011). "Typing Beats Scribbling: Indiana Schools Can Stop Teaching Cursive". TIME. Retrieved 30 August 2011. ^ "Hawaii No Longer Requires Teaching Cursive In Schools". Education. The Huffington Post. 1 August 2011. ^ Steinmetz, Katy (4 June 2014). "Five Reasons Kids Should Still Learn Cursive Writing". TIME.com. Retrieved 30 October 2015. ^ "Is cursive handwriting slowly dying out in America?". PBS NewsHour. Retrieved 30 October 2015. ^ "An act concerning education". ILGA.gov. Retrieved 30 August 2018. ^ Serratore, Angela (6 March 2013). "Is Cursive Handwriting Going Extinct?". Smithsonian. Retrieved 30 October 2015. ^ Mueller, Pam (2014). "The Pen Is Mightier Than the Keyboard: Advantages of Longhand Over Laptop Note Taking". Psychological Science. 25 (6): 1159–1168. doi:10.1177/0956797614524581. PMID 24760141. ^ Mangen, A.; Anda, L. G.; Oxborough, G. H.; Brønnick, K. (2015). "Handwriting versus Keyboard Writing: Effect on Word Recall". Journal of Writing Research. 7 (2): 227–247. doi:10.17239/jowr-2015.07.02.1. ^ "How cursive can help students with dyslexia connect the dots". PBS NewsHour. 6 May 2014. Retrieved 30 October 2015. ^ "Myths and Fact...Dysgraphia". NURSING Magazine. Retrieved 8 October 2018. ^ Pidd, Helen (29 June 2011). "German teachers campaign to simplify handwriting in schools". The Guardian. Wikimedia Commons has media related to Cursive.